Remember that you’re not doing this for yourself but for all the people that you want to help. Which is why you can’t give up right now. 1. Don’t tell yourself that you need to study for 12 hours straight. No one feels happy thinking that. Instead,tell yourself just 10 minutes. 10 minutes is manageable. Once started, you’ll probably work for more than 10 minutes. 2. Have a friend keep you accountable. 3. Read some blogs/watch Youtube videos by people who inspire you. I cycle through my favourite blogs written by ladies achieving high in their careers that is the career I’m aiming for. Seeing what can be just up ahead feel great! 4. Rewards are your best friend( besides the friend pushing you to keep going.) Instead of feeling guilty of taking breaks, feel good about taking breaks to refresh yourself. If you can, make it more than just a 10 minute Facebook break – go eat lunch away from your desk, chat with your grandpa about life goals, play with your cat, watch an episode of your favourite TV show. 5. ** If you’re going through tough emotional times, There’s probably a lot of thoughts swirling around in your head and it’s hard to focus. It’s tough – I feel you. You can do this!!! 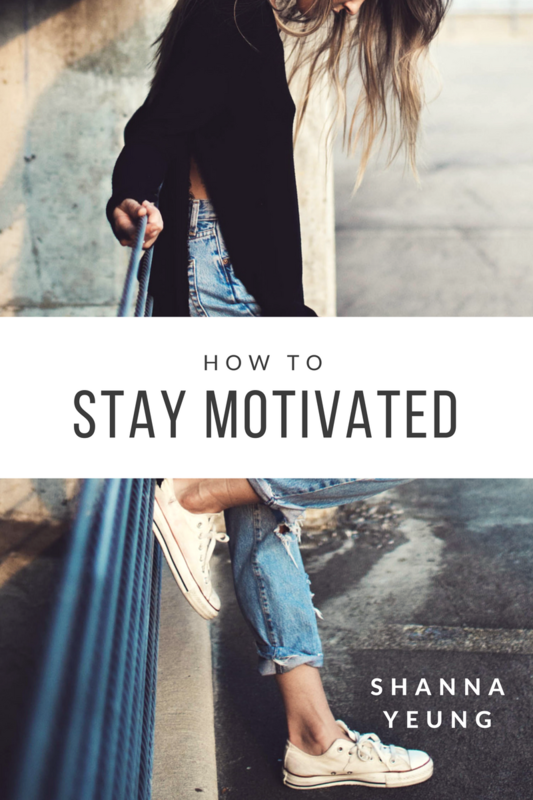 One of my favourite bloggers Andrea Tooley shared a tip -tell yourself that you’re going study for 30 minutes and then you’ll let yourself be sad for a bit and repeat. 6. Upbeat music. Yes, music can be distracting but overall, music that you like boosts up your mood. Even if it’s music with lyrics, music that’s not classical, if it makes you happy and jazzed up to study, then listen to it. 7. Don’t be afraid of uncomfortable feelings. Figuring out what you don’t know can make you feel dumb. Remember that the purpose of studying to make yourself feel less dumb. You’re getting smarter every bit more you study! 8. Make a To-do list that is small. Put one thing. That’s it. That helps with feeling so overwhelmed by all the problem sets you need to, all the lectures you need to do – no. Just put “Become confident about Organic Chemistry”. That’s all you have to do. You don’t have to do all 1000 problems in your textbook. You just need to have a fairly good review of OChem or Cell Biology (Bio 200 final – I’m scared of you but once I’ve studied more, you’re be scared of me!) because you’ve been learning lots for the last few months. 9. Make a Cheat To-do list that you put other unimportant or fun to-dos on. E.g. I think I’ve put “Message that guy who’s organizing a ball hockey team.” and blog post ideas and other distracting things that pop up. 10. Journalling or blogging is helping to clear your mind. Sending you virtual hugs to get through your hard times. If you’re overwhelmed and struggling right now, I want you to know that you’re not the only one. Everyone else’s life may look perfect but there are many of us floundering around lost. Our lives are messes, and when it seems like the storm has stopped and it’s a chance to start rebuilding, a stronger storm blasts in. Remember this in the darkest of times: storms do not last forever. There may be multiple storms but they stop eventually. Here’s my confession: I’ve struggled a lot this year. I struggled even though I tried to be strong – and now I’m here – back up and ready to take on the world. But I’m thankful for my struggle. I’m thankful that this time has rehighlighted how amazing my support system is. I’m so thankful for my friends that I can talk to , joke about silly things like ice cream cravings with, and go on adventures with. In a faculty where I’ve already encountered nasty people who compete and take each other down, my friends and I genuinely support each other to the best we can in our classes and extracurriculars. I’m thankful for a loving family that gives me freedom to live life how I want to. I’ve also learned who shows true colours and actually tried to make me feel worse. But that was just one. The rest of my support system are so incredibly amazing and I’m so thankful for each and everyone of them! The key thing is that I still am struggling but I’m digging myself back up and fixing things. It means that I still fail a lot and I still lapse in feeling so overwhelmed. But I’m moving back up. At least that’s what I’m telling myself and this positive self pep-talk is a great sign. I’ve been testing all sorts of things and here is a list of tips of things that I found really helped! I’m not qualified to give my two cents on anxiety or depression. The tips below are only for temporary periods of stress. PLEASE go see a trained counsellor if you’re concerned. UBC Counselling Services are free and confidential! Write out your To-dos and priorities short term and long term while asking myself whether that to do is urgent and/or important. When your life has been a mess and you’re trying to rebuild, focus on just ONE thing. My current goal is to get back on track with my schoolwork which means I’ve let club activities and research go to the side. Leave training for a marathon & learning to cook Italian cuisine & learning how to speak Korean off your list for now. We are at the rebuilding stage right now. We’re advance ourselves to the self-improvement stage later okay? Write down everything that you’re thinking about in a notebook or on your phone. This is NOT the same as the To-Do list. Write to release all the thoughts in your mind. Write about what’s being making you stressed, what’s been making you stressed. Write about what your ideal self would be like. Write about what you want out of life. This sounds dumb but positive visualization is great. Spread happiness. Send well wishes, even just a simple Have an awesome day :), to a friend or loved one. Do little things that make someone’s life easier. Play music. I find that listening to music helps me take my mind push away unrelated thoughts and lets me focus on the task at hard. Electronic dance music never fails to put me in a productive mood. Schedule friends to eat lunch with. Bonus points if you reach out to friends that you haven’t seen for a while. I eat lunch with the wonderful usuals Alyssa, Veena, etc. I made the effort to reach out to people you haven’t talked to in a while e.g. I met up with a close high school friend, my Big, an elementary school friend. I know that socializing lands at the bottom of your To-Do list but feeling connected to other people, listening to the troubles and jokes and good things that happened to your friends can brighten up your mood and put your own problems into perspective. Eat enough even when you can’t stand the sight of food. Eat because you need your strength to be a warrior in your own life. On the end of spectrum, binge eating is not the healthiest way to deal with stress. Make yourself feel beautiful. e.g. I deep conditioned my hair while I was studying for Organic Chemistry. Necessary? No. Did it make my hair feel amazing and give a boost of self-confidence? Hell yeah. Silence your cellphone. PING facebook notification. PING text notification. PING new email. PING PING PING. The sound of my cellphone pinging stresses me out because so I like to turn my phone on silent. Designate some time to intentionally be unproductive. Let your emails go unanswered. Put off the laundry. You deserve this time off. You NEED this time off so don’t feel guilty about it! Take time to hermit at home instead of running across the city from volunteering to work to the grocery store to (10000 other places). Put your stress into perspective. I remembered that being stressed by school and other responsibilities are nothing next to real issues like health issues and death. My friend Sharleen recommended “Me Before You” to me and the heavy issue of right-to-suicide made me think about how inconsequential my stresses are in comparison. Plan something fun to look forward to at the end of the week. Take a day to be highly social! For you, it could be a huge gathering of friends. Or it could be a fabulous Thanksgiving dinner. It would be one-on-one time with a loved one or friend. Mine was Friday when I was literally not alone from 8 am to 10:30 from class, to pseudo-studying (hanging out under the guise of studying) with friends in the Nest, to being socialites at Circle K International’s general meeting, to hanging over bubble tea. So. much. socializing. It was tiring but really really nice. Smile because you deserve to feel happiness. I haven’t been posting as frequently as I used to because these posts take several drafts and multiple hours to write & edit. Based on your page views & comments, it seems that you guys like longer and general admore meaningful articles for you all! Let me know in the comments whether you prefer these kinds of posts more. Are you like me: do you like to try new things? Do you believe that as long as you try you’ll get it eventually? That after asking for help and changing up the way you do things, you’ll get it right? But then you don’t. You’ve tried a lot. You’ve put hours and hours of time. You’ve asked for help. You’ve contemplated giving up but you didn’t. You packed up everything you did, splurged on a Starbucks tea to bribe yourself, and worked on it. I have to admit to myself that it was out of my scope. But by trying, I’ve already expanded what I can do. I’ve pushed myself and I’ve grown. Next time, I’m going to be able to do more than I did this time. I can learn a lot from giving up. Now that I’ve passed it on someone I highly respect and has decades of experience on me, I’m going to examine it after he’s done with it. I’m going to compare it and learn what was needed to done to improve it. Even if you admit defeat, you’re still a fighter. Continue on to challenge yourself. • The weekly pre reading assignments are really short and easy. Do not stress about them but make sure you do them. • clicker marks are participation based so don’t worry about getting them wrong. • Important: Keep up with your pre readings. • Come to class early to get a seat near the front. • There are no old exams available to study from but the professors make a ton of practice questions for you. • Do as many practice questions as you have time for. • Befriend a classmate through the course online forum. I befriended Erica through the forum! • Share your answers to the practice questions with your classmates. • I left the midterms and finals wanting to cry. If you feel this, don’t cry and have faith that the TAs may think that your answers sound more coherent than you think they do. • Be sure to buy the Custom textbook for this course. It will help you a lot because the professors do not have time to cover everything in their lectures. • The wording of the quizzes can be tricky. • The exams are really easy (especially the midterm) and are multiple choice only. • Lecture attendance is not mandatory. There are no clickers.